This 3.7V 500mAh LiPO battery is a replacement battery. Direct replacement battery for UDI U818A U817A U817 U818A-1 RC Drone Quadcopter, no modification is needed. ✈Capacity:3. 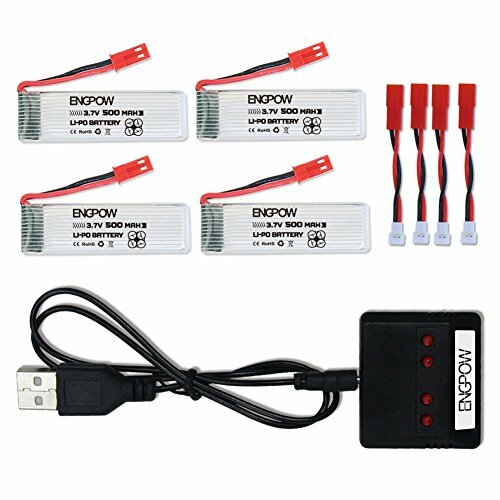 7V 500mAh rc drone battery, guarantee more flight time, high drain lithium-polymer rechargeable battery. The battery is made of 100% lithium cobaltate , and it has a longer charging life. ✈Size:57mm*18mm*7.5mm/ 2.24 x 0. 71 x 0. 3 inch,Weight:16g / 0. 56oz. Easy pull feature - easily take the battery out of the drone without pulling the cord,easy to insert and pull out battery! ✈Package including: 4pcs batteries, 1set 4-port charger, 4pcs adapter cables, can charge 4 batteries at one time!The charger has a very good connection with each batteries. If you have any questions about this product by ENGPOW, contact us by completing and submitting the form below. If you are looking for a specif part number, please include it with your message.